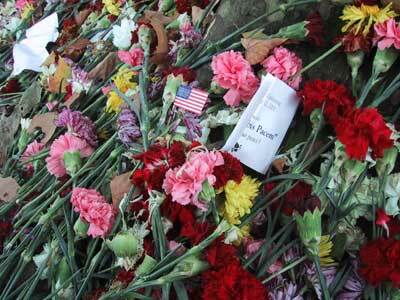 After the terrorist attacks of September 11th, the Vassar community was quick to respond. Within hours, a large-screen TV and phone banks were set up in the Villard Room for students to watch the unfolding events and contact their loved ones. 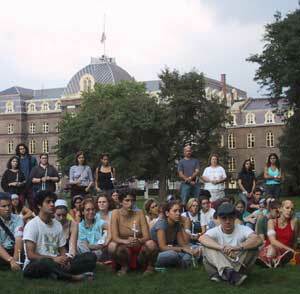 The following day, President Fergusson held a community gathering on the library lawn. The on-campus efforts to console, counsel, and support the Vassar community continued the rest of the week: The Chapel was open 24 hours a day; the Counseling Service extended office hours and held seminars on dealing with grief; faculty and house fellows held discussions in classes and residential halls, and the community attended candlelight walking meditation circles. In addition to these events, faculty members moderated a panel to over 400 people from the Vassar and Poughkeepsie communities on the civil and political implications of the terrorist attacks. During the community gathering on September 12th, students, faculty, and staff sang dona nobis pacem (give us peace), observed several minutes of silence, and then placed flowers at the base of the London plane tree in front of the library. In the days and weeks following, a need to participate in the healing process grew. To help on-campus groups organize and facilitate planning related to the tragedies, the college created a September 11th Task Force. Events this semester included a service and planning of a memorial garden near Ely Hall; a library Website to educate students on topics related to September 11th; and a lecture by Paul Loeb, author and scholar, about what it means to be a citizen today. In addition, two more panels are planned for this semester, and next semester, a half-unit course on terrorism will be sponsored by international studies and American culture. In all of these events, the college is attempting to allow multiple points of view about the causes and consequences of September 11th to be expressed. In addition to ceremonies remembering those lost and those touched by the tragedy, the Vassar community made special efforts to reach out to members of the Muslim and Jewish communities. "I’ve been very proud of the way student religious leaders have taken an active role in a wide variety of outreach efforts — Muslim students have organized a fund drive for the Red Cross, Roman Catholic students gathered supplies for rescue workers, students from many different religious and volunteer groups are working to compile data for the regional blood drives, and members of the Jewish, Christian, and Zen meditation communities have organized special services, gatherings, and discussions to support one another and welcome others," said Sam Speers, director of the Office of Spiritual and Religious Life. As the flag flies at half mast, Director of Religious and Spiritual Life Sam Speers addressed members of the Vassar community. According to Vassar Student Association President Adrienn Lanczos ’02, some students "saw in the tragedy a renewed need to encourage peaceful international relations, and have since developed and joined in grassroots movements to that effect. Also, there was a letter-writing campaign organized urging leaders and peer institutions to realize the importance of peaceful methods in this difficult time." However, Lanczos went on to state, "Not all students were united in their broader political stance, but it seems as if most Vassar students have expressed a sense of frustration with those who would allow misinformed prejudices and impulsive reactionary politics to guide the domestic response of our wounded nation." In a letter to President Bush, many students, faculty members, administrators, and staff, praised the President for his efforts thus far as well as urging him "to continue to use the channels of diplomacy and law to bring the terrorist criminals to justice, and counsel all possible restraint in the use of force.... The war on terrorism must be a war on poverty and ignorance at home and abroad, as well as a war on those who perpetrated the crimes of September 11. It must not be a war on foreign cultures or foreign populations." Unfortunately, the Vassar community was not left untouched by the terrorist attacks; we lost two alumni. Ruth Ketler ’80 was director of research for Fiduciary Trust, and John Schwartz ’75 was a bond broker for Cantor Fitzgerald. Our heartfelt condolences go out to Ruth’s and John’s friends and families and to all those touched by these events. "I worked on the 103rd floor of 1 World Trade for three years, and in the World Financial Center for five years. About two weeks after the attack on the WTC, I went to Ground Zero. Like everyone else, I felt devastated. How could I ever help my children feel safe when the Twin Towers, so seemingly permanent and stable, could be destroyed in a matter of minutes? With these thoughts, I went to Vassar for the Volunteer Leadership Conference. What a relief to see the campus—at least that part of my life still existed! As I talked with alums and walked around I realized that it was not so much the sight of the campus that gave me such a sense of stability and continuity; rather it was the feeling of community and affiliation that made me feel better. That's what I decided to tell my children—it’s not so much the things in our lives that matter, it’s the relationships that we create and nurture." 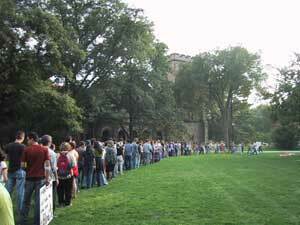 The Vassar chapter of Peaceful Justice organized a march on September 21st. Approximately 100 participants, mostly Vassar students, joined in a silent march through the streets of Poughkeepsie. "The reaction was mostly positive, some people even joined in the middle of the march and walked with us part of the way," said Charlotta Åsell ’03, who helped organize the march. "I will remember watching, with horror, the twin destruction wrought by terrorists on the towers of the World Trade Center and the Pentagon. Unlike all but a very few Americans though, I viewed those events from a vantage point half a world away in the capital of the Central Asian country of Kyrgyzstan, Bishtek. All that separates me from the apparent refuge for many of those responsible for the terror, Afghanistan, is the tiny nation of Tajikistan, about the size of the state of Wisconsin. I find myself, quite literally, in a frontline state witness to a tragedy of unprecedented magnitude." "Enormous solidarity is being expressed over here…heartwarming in an otherwise chilling time." "I take enormous pride and no little comfort in the national effort to rouse ourselves in solidarity with one another and with a host of nations around the world that insist mass terror is simply not an acceptable instrument of political strategy."